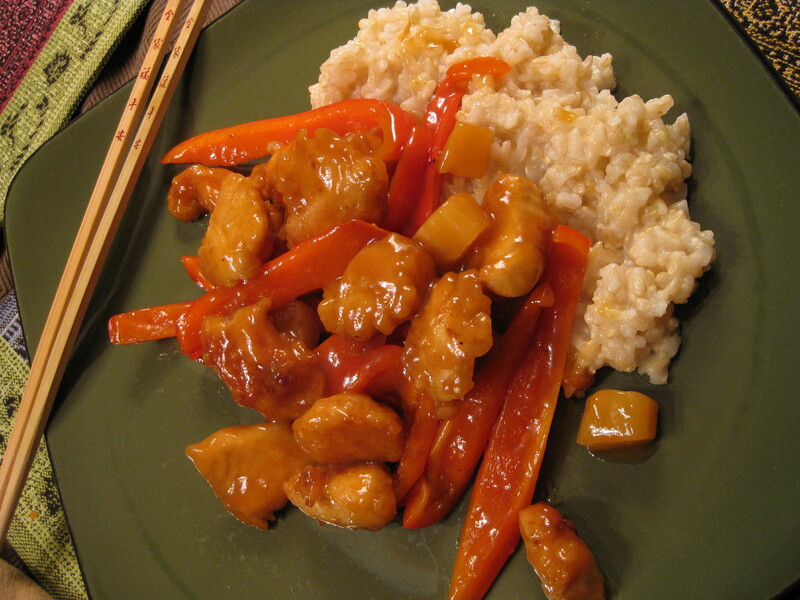 Sweet and Sour is very very easy. Anything can be made with the method- any protein and any veggie. Also, a gluten-free tempura batter is simple and traditional. Gluten-free limits breaded and fried at most restaurants. Here is how to get the ultimate crisped meaty pieces with minimal effort. Cut 1 lb of chicken, pork, or tofu into equal sized pieces. If using shrimp, medium shrimp are best. Having all the pieces the same size will give you an even cooking time and proper bite sizes. You can also batter and fry broccoli florets, sweet potato cubes, onion rings, zucchini chunks, or other veggies for a soy-free vegan version. This should coat at least 1 lb of meat or tofu. Veggies tend to hold batter in their crevasses– see broccoli florets– so you may want to do 50% more batter if you are tempura frying veggies. Also, since this is a very fun meal for guests, try doubling it to feed tons of people! I fry in sesame oil or peanut oil. Sesame oil has a lower smoking temperature. A blend of the two will give you the best flavor. Sesame is fine to use by itself or with another veggie oil if peanut allergens are a concern. Heat about 1 inch of oil in your wok. Test the oil for readiness by putting a drop of batter into the oil. It should fry up crisp very quickly. Also, you can put the handle of a wooden spoon in your oil. Bubbles will form around it when the oil is hot enough. Carefully add your battered meat or veg, about 6-8 pieces at a time depending on the size of your wok. Do not crowd the food. Let fry on one side for about 3 minutes until GBD (golden brown delicious). Flip food for another 3 minutes. Transfer to a towel to drain. Repeat until all battered meat and veggies are GBD. Mix rice vinegar, corn starch, and pineapple juice together. Set aside. Drain off extra oil from wok. Toss in bell peppers and stir fry for 3 minutes. Add pineapple chunks. Stir fry for 2 minutes. Add liquid mixture and stir fry for 3 minutes until mixture begins to thicken. Toss in cooked tempura meat or veggies. Coat well. Serve over rice. If the red color you see in restaurants is important to you, you can use a veggie based food coloring or beet juice to color your sauce.